The Holidays are coming and Walt Disney World is rapidly preparing several special offerings throughout their parks and resorts. At Disney’s Hollywood Studios, there will be some exciting new ways to celebrate this year, including Sunset Seasons Greetings. As night falls on Sunset Boulevard, an unforgettable holiday scene unfolds. 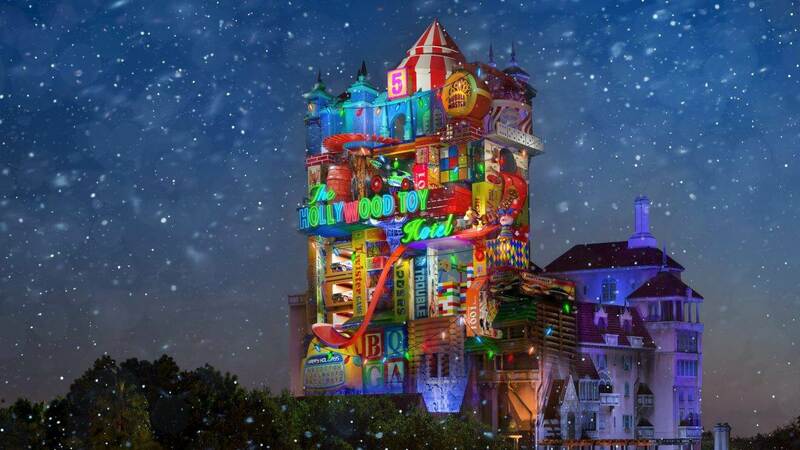 Billboards come to life and iconic characters share their love of the season as the Hollywood Tower Hotel transforms to accompany their stories. Today, Disney revealed some new concept art to show just how the iconic tower will look when it is visited by your friends from “Toy Story” and is transformed into the Hollywood Toy Hotel. Sunset Seasons Greetings takes place from November 9 through December 31. Be sure to check out the other ways you can celebrate the Holidays at Walt Disney World.